I thought Quaid was nothing short of magnificent and much better than Kilmer in Tombstone, and he wasn't exactly bad! I've been meaning to watch Wyatt Earp again for quite some time, but somehow never get around to it. Glad you enjoyed it, Pete! This is a good episode... but not one that is particularly great. A little slower of an episode for my taste. But is worth watching. Nothing really special happened worth talking about actually... just a standard episode. This is one of the movies I got in the 20 Greatest Westerns: Heroes & Bandits boxset that I found in the Walmart Bargain Bin recently. When I bought the set I knew not to expect very good movies despite the name of the boxset... and I also knew not to expect much quality wise. But I figured 20 movies for $5... what the hell... why not. So needless to say I was a little worried when I popped this one into the player. Now I can't say it will be so with all the movies in this set... but in the case of Winds of the Wasteland the quality, while not good, really wasn't too bad. Sure it could have been a hell of a lot better... but it is definitely watchable. And OMG... John Wayne was young in this movie! This has to be the earliest of his movies I have ever seen. This movie was released in 1936. I really enjoyed this story. It was interesting.... everything moved along quickly... and they also had some comedic relief in the form of an older guy played by Lew Kelly. Between some of the things he said and done... he had me literally laughing out loud a few times. I especially liked how while riding in the back of the stage coach that was being shot at he took the cushion off the seat and hide behind it as if it would stop a bullet. Then I also liked at the end of the movie where he had himself a pet skunk on a leash. 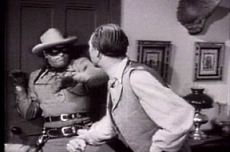 This movie had a lot of Western action and comedic situations all rolled up in a movie that only lasted 56 minutes! This movie alone made it worth it to me to get this cheap low-budget boxset. Only thing that would have made it better is if the quality was even a little better. I would give the movie itself 4 stars... but the lower then desired quality will knock it down to to 3 and a half. That's the kind of movie I mean when I refer to "B" westerns...cheap movies shot in about a week...and many of them aimed at younger viewers. You have another of Duke's B's in that set...Blue Steel. Maybe you'll want to watch that after you watch a longer film...though I doubt you have any others as long as Wyatt Earp. Well... I tell you what... I enjoyed that "B" Western... and looking forward to checking out more like it. 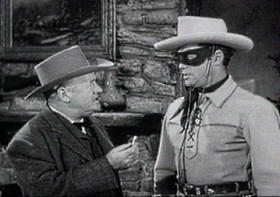 After the episode of The Lone Ranger I will probably watch Open Range. This is a good episode. I really enjoyed the story. I am surprised to say that I now have my daughter Brittany enjoying The Lone Ranger as well. Packed with epic action, Open Range is a powerfully gripping story that's never been told until now, and stars Academy Award® winners Robert Duvall (John Q) and Kevin Costner (Tin Cup), and Academy Award® nominee Annette Bening (American Beauty). A group of free grazers, four men trying to escape their pasts, are driving cattle and living off the land on the open range — a place where nature makes the only laws. 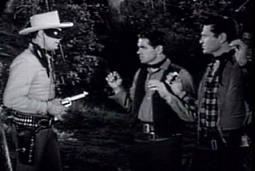 when a ruthless, evil rancher tries to run them out of town, the men's peaceful existence takes a tumultuous turn and ends in the grittiest, most explosive gunfight on film as two men battle a town for honor, justice and a way of life that's quickly disappearing. This is another one I have never seen before. Not hard to believe since I just recently gotten into Western movies. I was told before watching this movie that this one had some beautiful photography. And I agree with that. It makes me wish I got to see this one at the theater. It is a good movie. I enjoyed it quite a bit... though I would say that parts of it moved a little on the slow side. But over-all it is definitely worth checking out if you are in the mood for a Western. Anoher good episode. I liked the storyline. 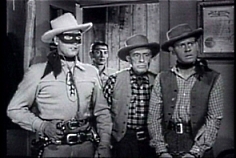 I liked how The Lone Ranger got the hostage away from the rustlers. An ex-gunslinger who survives his own hanging turns into a mystical avenger fighting for justice in the Old West, coming first to the help of a young widow who is trying to keep her silver mine from the clutches of an unscrupulous land baron. This is the second movie I have now watched out of that 20 Great Westerns boxset I found in the Walmart Bargain Bin. This is actually a TV Movie from 1974. When I found that out I was quick to pop this one in... as it has been my experience that I really enjoy the TV movies from the '70s. In this case I would say it is a decent movie... but nothing really great. While it was a good story... I just didn't care about any of the characters in this movie. Once again the quality of this movie is better then I expected. Even though the image was a little on the dull side... for the most part the image was clear and more then watchable... with only a little dust noticeable on the film. And no problems with the sound either. At least not on the cheap standard TV and extremely old Surround Sound that I have. One of these days I need to get me some new equipment where I can really judge the quality of the DVDs I watch. Well, I'm, always curious as to who's in movies, especially westerns, so I looked this up in one of my books since you didn't mention any cast members. I found some pretty familiar names here: Steve Forrest, Cameron Mitchell, Dean Jagger, Will Geer, Ray Teal and a favorite character actor, Hank Worden though he's way down in the credits so he probably didn't have much of a part in this one. I didn't recognize any of the names myself... but that is not surprising. The only name that looked even half way familiar is that of Sharon Acker... and that is only because I am so familiar with Amy Acker (Angel, Dollhouse)... wonder if maybe Sharon Acker is her mother? This is a really fun episode. Not only is there lots of good action... but there is plenty of laughs with the characters of Pete and Pedro (Played by Rufe Davis and Don Diamond). Probably one of my favorite episodes of the few I have in this set. Another from the 20 Great Westerns boxset I got from the Walmart Bargain Bin. This movie stars John Wayne in one of his earlier roles. Also in this one is George Hayes and Eleanor Hunt. Though I am not familiar with them. While I enjoyed the other John Wayne movie I watched (Winds of the Wasteland) quite a bit... this one not so much. It just wasn't nearly as entertaining for me. The quality wasn't up there either. Some scenes the audio and video was very good... but in other scenes there was a lot of dust and scratches... and there as a low hissing in the audio. Too bad you didn't care that much for Blue Steel. I seem to recall liking it but I haven't seen it in probably over 10 years. I should point out, however, that George Hayes is probably the most famous character actor to ever work in westerns...but most people just call him Gabby Hayes. I would have recognized the name Gabby Hayes! I took the name from the actual credits so... I am sure I didn't recognize him himself because it is such an old movie. Well... looks like I will have to end this marathon now. We have company here this afternoon so don't look like I will have much time for movies for most the rest of the day. Well at least it has been fun... and hey... all real Westerns this time huh Roger?